The Kübler-Ross model describes the five emotional stages experienced when faced with impending death or death of someone. The five stages are denial, anger, bargaining, depression and acceptance. Similarly, change is a irreversible and unapologetic event. Here are 5 alternate stages for legal professionals to help navigate change in the legal market. Legal professionals aren't shy about adopting new technology. Just look at smartphone and tablet adoption rates among lawyers in the past 4 years. I believe the pager, cell phone and blackberry enjoyed similar successes. However, adoption is not acceptance of a new reality. The technology examples above just empowered existing workflows, it did not fundamentally change the dynamics of the marketplace. Technology like smartphones just enabled lawyers to communicate more efficiently not necessarily differently. We are now in the midst of a revolution whereby the core value of a legal professional (providing legal counsel) is shifting towards platforms, algorithms and data (Robolaw). Its not a faster way of drafting an agreement, its accepting the fact that you do not ever need to draft one. Acceptance of the new reality should be a feast. A celebration of the fact that the tedious & repetitive have died and made way for the joy in legal work. My faith in technology is derived from a believe it has saved my life. Yet faith alone may not suffice in winning the hearts and minds of legal professionals. We'll need evidence that robots can do a better job before we trust them. Proof is mounting that platforms (crowdsourcing) and algorithms outperform humans in predicting legal outcomes. However its not like IBM Watson has already passed the multistate bar exam and is now a licensed attorney. Legal work isn't a chess match or a equation but a complex nuanced construct of emotions in text. And therein lies the problem: the share amount of ambiguous texts. I read this inspiring story: ‘Barefoot’ Lawyers Teach Ugandans Their Rights’. It seems 97% of lawyers serve a population of 2 million people within the capital. The remaining 3% is left to serve a population of around 36 million in the rest of Uganda. In order to alleviate the travel burden covering an area of 241,038 square km, Ugandan lawyer, Gerald Abila, uses volunteers and a range of technologies like social media to educate and provide legal advice. I'll compliment Gerald on embracing technology to bridge the gap and his story highlights a fundamental principle about legal work: it is most effective if served in person. Mobility is the cornerstone of the legal profession. 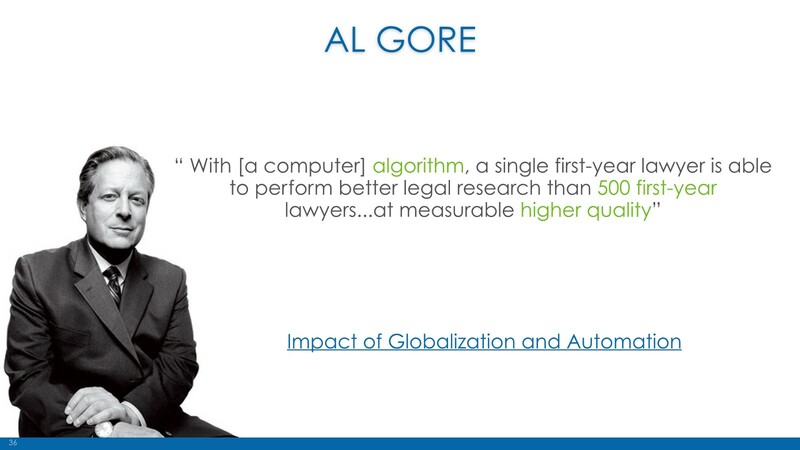 It is one of the main drivers of technology adoption among legal professionals. If only the mobile tools were as good on the road as they are at home. I have dedicated most of my writings in the past 4 years on this subject. I even went as far as declaring the death of legal research on desktop. While I believe the cause of this imbalance has many factors. A root cause may also lie in the very nature of the legal professionals. See stage 5. #Robolaw: A World Without Law elaborates on the necessity of simplicity. Driven by the rise of digital currencies, the world is moving towards a frictionless reality. 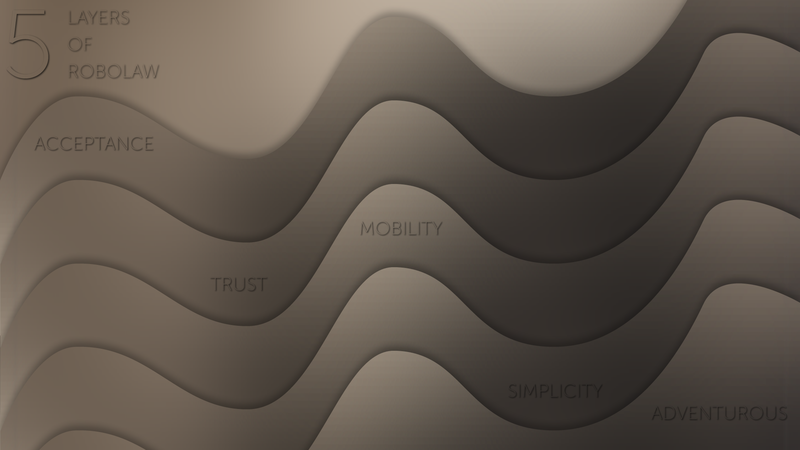 One where simplicity is handsomely rewarded and complexity is not welcome. Yet, any legal framework is build upon barriers. The law revolves around setting rules and exceptions. Its goal is to avert risk and minimize misunderstandings. It is there to protect us from ourselves. Nevertheless, legal products and services need to become clear and simple as a Shake of hands. Actually, it may become invisible, even in the event of disputes. This future is more likely to happen if we let robots do the negotiations and dispute resolutions. Just like we will trust them to drive our cars. We may only need a notification or a glance. In the search for simplicity, one characteristic will truly serve us: experimentation. There are penalties for failure in every profession, in some the consequences are far more severe than others. However, I believe this new era is giving us a license to try new stuff. This era of relentless change has set us free from a stigma of dumb and has opened a world of daring.